Pfaff BMW in Mississauga is the place to be if you are looking for sports cars for sale. We have a very large selection of new and pre-owned sports cars that are waiting for you to get behind the wheel of. In this article by Pfaff BMW, we will talk about the 2018 BMW M4. We encourage you to schedule a test drive at your earliest convenience if this vehicle, or any other vehicle, interest you! Read on for more information. Unconditionally sporty, with dynamic styling and a palpable intensity that is without equal on the road. The impressive front section with the large air inlets announces the immense power of the BMW M4 Coupé, as do the evocative light alloy wheels and the muscular rear. The curved styling with the typical gently sloping roofline of a coupé, combined with the exclusive light alloy wheels and the aerodynamically optimized M exterior mirrors, radiates concentrated sports appeal. The stretched silhouette is concluded by a distinctive rear and expresses pent-up power. 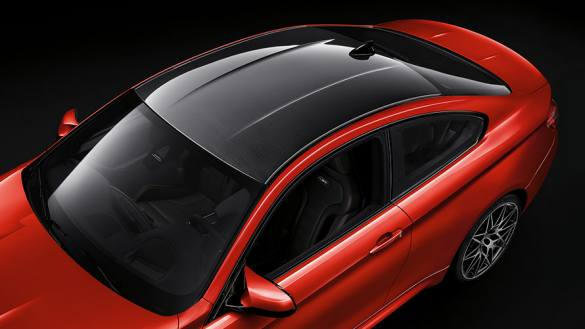 As part of the BMW intelligent lightweight construction concept, the Carbon roof made of carbon fibre reinforced plastic (CFRP) helps to reduce the vehicle’s weight, shifting the car’s centre of gravity lower. This leads to an increase in agility and dynamics when taking a bend, accelerating and braking. Over four decades of developing high-performance vehicles, the goal has always been to achieve a perfect interplay of power unit, chassis, transmission and steering, with the driver’s impression the benchmark. The BMW M4 Coupé embodies everything that is distinctive about BMW M. Every detail is primed for outstanding performance and precision. A set-up for pilots that is hard to beat. The BMW M4 Coupé has completed hundreds of tests on the racetrack in order to hone numerous innovations derived from motorsport to production maturity. The result is more than impressive: concentrated power with a breathtaking acceleration meets extremely agile and high-precision handling. In any driving situation. On any road surface. A guaranteed adrenaline rush is included, together with a knowing smile. The heart of the BMW M4 Coupé is the M TwinPower Turbo inline 6-cylinder petrol engine. With its tremendous power and unmistakable sound. Interplay between optimally tuned motorsport technologies permit a thrust of 425 hp, which with the optional M Competition package can be increased still further to 444 hp. The 3.0-litre M TwinPower Turbo inline 6-cylinder petrol engine blends the best of two worlds: a high-revving character capable of up to 7,600 rpm, and superior power culminating in peak torque of 406 ft-lb. Bi-turbo direct injection and typical M fine tuning make sure the engine responds directly to even the slightest touch of the accelerator with vigorous thrust and confident traction. Numerous innovations such as sleeveless construction or a lighter, forged crankshaft build on the intelligent lightweight construction concept, improve dynamics and acceleration, reduce consumption and enable an optimum axle load distribution of almost 50:50. The reward: unprecedentedly agile handling that’s impressively underscored by the unmistakable sound of the M engine. You can find premium quality, and very powerful, sports cars for sale at our Pfaff BMW dealership in Mississauga. The 2018 BMW M4’s are really something to behold. Experience the raw power and handling of this monster of a sports car by scheduling a test drive today! Click here to find our contact information, schedule a test drive, or to fill out our contact form.